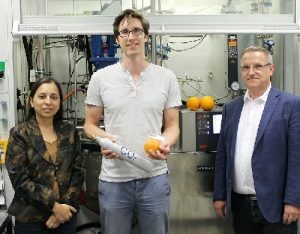 Take orange peel, extract the natural substance limonene, oxidize it and connect it with carbon dioxide, and what is produced is a biobased plastic, the basis for various industrial applications without high costs. PLimC, for poly(limonene carbonate), is the name of this green all-rounder that scientists from the University of Bayreuth, Germany, have produced. The polycarbonate results from a synthesis of limonene with carbon dioxide. This ensures that it does not contain the harmful substance bisphenol A, in contrast to conventional polycarbonates. In addition, the new bio-based plastic has a number of properties that makes it attractive for industrial applications: PLimC is rigid, extremely heat-resistant and transparent; therefore it is particularly suitable as a material for coatings. Example of such new PLimC-based plastics are antimicrobial polymers, which are capable of preventing an accumulation of E-coli bacteria. As materials for containers, which are used in the medical treatment and care, they can significantly reduce the risk of infection. Also for the production of plastic implants such polymers can be interesting. Another example is sea water-soluble polymers that dissolve in the salty sea water into ecologically harmless components, and then decompose. Such plastics may – if they are used for bottles, bags or other containers – counteract the dramatic increase in pollution from non-soluble plastic particles.